February is Black History Month, I wanted to highlight a couple government resources that provide a wealth of information relating to the history and the cultural and societal impact of African Americans in our country. AfricanAmericanHistoryMonth.gov, a web-portal collaboration project between the Library of Congress and the National Endowment for the Humanities, National Gallery of Art, National Park Service, Smithsonian Institution, United States Holocaust Memorial Museum and U.S. National Archives and Records Administration. African American History Month utilizes historic images, exhibits, collections, audio, and video to create a comprehensive resource for the history and promotion of African American contribution to our country’s culture and society. I recommend educators and researchers of American history and culture to explore and utilize this wonderful website. On September 24, 2016, the National Museum of African American History and Culture (NMAAHC) opened as the first and only national museum devoted exclusively to the documentation of African American life, history, and culture. The Museum, the 19th and newest museum of the Smithsonian Institution, collected more than 36,000 artifacts and nearly 100,000 individuals have become charter members. In addition to viewing this magnificent museum, the NMAAHC also possesses a digital collections holding for researchers to browse by topic, date/era, or place. Combined, these two online government resources offer a thorough and engaging look into the history and contributions of African Americans in culture and society. 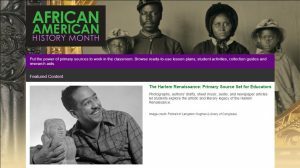 In addition to their helpful research resource, the African American History Month website also covers the history of the origin and commemoration of Black History Month. The text below is found with the About section of the website, and is an excerpt from an essay by Daryl Michael Scott, Howard University, for the Association for the Study of African American Life and History. The Law Library of Congress has compiled guides to related to Black History Month, including a comprehensive inventory of the Public Laws, Presidential Proclamations and congressional resolutions.